The short answer is yes, they would go to Hell if they die living in a backslidden state, in a lifestyle of sin, even though at one time they accepted Jesus as Saviour and Lord. However, there are likely exceptions to this such as a person who is not mentally mature or someone that has mental health issues. But for the most part, someone living in unrepentant sin as a lifestyle would go to Hell if they do not repent before they die. If you think this is you, repent now before you become reprobate, forever lost, or before you die. You are not promised tomorrow. Below are 9 pages from my notes of Scriptures talking to believers not sinners about falling away. It is not a small subject in the New Testament; it is quite large. Yet it is amazing how few Christians believe it is possible to fall away due to misunderstanding the message of grace. However, the backslider as long as they are still breathing can repent. If they repent, they are in right-standing with God again and would go to Heaven. A backslider is living in sin on purpose – knowing it is wrong but has no intent on stopping their sin. 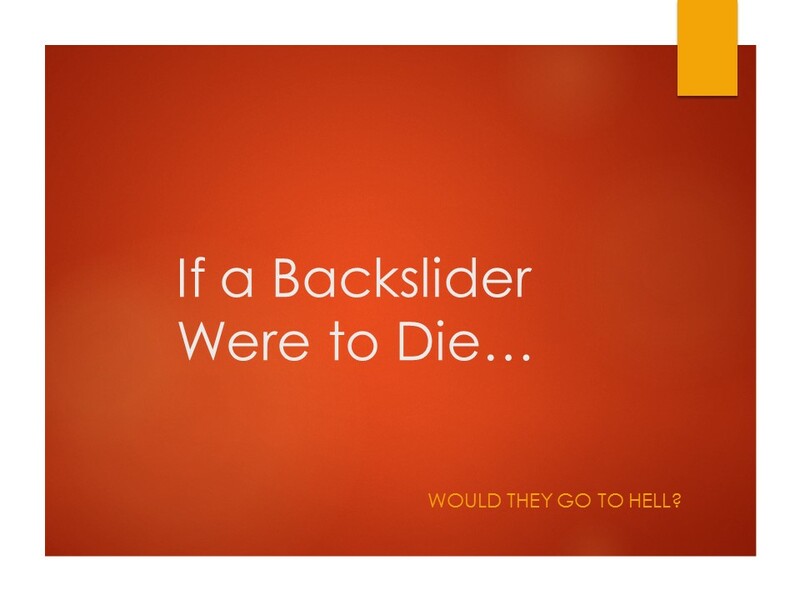 The backslider is on purpose enjoying sin so much that they does not want to live for God. This person’s sins are not covered by the blood of Jesus until they repent. You see positionally the backslider’s spirit is still righteous but that doesn’t mean they automatically go to Heaven. Technically, they are not lost at the moment, i.e. they did not yet lose their salvation. That is why they can repent and positionally still be right with God. One cannot be saved, then lost, then saved, then lost every time they sin, then repent, then sin, then repent, etc… Positionally, the backslider is saved until they die. But if the backslider does not repent, then at death their sins are applied to their life. They would lose their status of being in Christ, in the Lamb’s book of life, and would go to the Lake of Fire forever. How can I say that? Well, below are the Scriptures on this subject for you to prayerfully consider. I challenge you to prove me wrong. There are two types of people who call themselves Christian but do not produce the fruit of a Christian. One is the false Christian, the one who acts like a believer on the outside but on the inside they are of the devil – having the devil’s nature rule them. Examples of these are the false prophets and false teachers we are warned about in the New Testament. The other group of people who call themselves Christians but do not produce the fruit I call positionally saved but are lost. They do not do the will of God. They do not submit to the lordship of Jesus Christ, however they genuinely prayed a salvation prayer from the heart by faith. These are positionally saved but they are not right with God. They are backslidden. These backslidden Christians may have walked strong with God in the past. They may have even been filled with the Holy Spirit and spoke in tongues or operated in the other Gifts of the Spirit. They may go to church regularly and talk about God all the time. They may seem to worship God with passion. They know the Bible and love to do morally upright things. They would consider themselves good people. To other Christians they would appear to be someone who is a true believer. But they are not. In their heart they are rebellious because they want to live life on their terms, not Jesus’. In the depths of their being they believe in God, but they will not repent of sin in their heart. These are Christians positionally; by that I mean the Spirit of God has not left them. If they were to repent, they would be immediately right with God and would enjoy full fellowship with Him. If they lived a repentant life and were to die, they would be on their way to Heaven. However, if they did not repent and were to die, they would be lost. They walked away from the lordship of Jesus Christ. They wanted the benefits of being a Christian without obedience to God. That will never work in God’s system. He cannot be deceived even though man may deceive himself. Luke 6:46 NASB “Why do you call Me, ‘Lord, Lord,’ and do not do what I say? How can prophecy be done by false disciples? Because prophecy can be faked. But how can casting out demons be done by false disciples? It cannot. The casting out of demons cannot be done without the authority of the name of Jesus [The seven sons of Sceva Acts 19:14-16]. So at one time they were right with God and then they fell away and are backslidden. How can miracles be done by false disciples? They cannot. However, miracles can be done as a crowd seeks God by faith and God extends mercy to them. What often happens is a false preacher takes the credit even though God responded to the people, not the preacher. How could Jesus say He never knew them but they were at one time saved? This person never came to know Jesus as their Lord through obedience, as stated in 1 John 2:3-4 NASB “By this we know that we have come to know Him, if we keep His commandments. (4) The one who says, ‘I have come to know Him,’ and does not keep His commandments, is a liar, and the truth is not in him.” They prayed a prayer and may positionally have gotten saved. But they never obeyed God, allowing Jesus to be their Lord. They never knew Him. Therefore, at death, they would be lost forever just like any other sinner. James told us the Truth when he said James 2:17 NASB “Even so faith, if it has no works, is dead, being by itself.” And again, James 2:20 NASB “… faith without works is useless?” ” And AGAIN, James 2:24 NASB “You see that a man is justified by works and not by faith alone.” Do you think God was trying to get a thought across to us by repeating it over and over and over? If you are born again, you will follow through with a lifestyle of good works. Matthew 25:10-13 NASB “And while they were going away to make the purchase, the bridegroom came, and those who were ready went in with him to the wedding feast; and the door was shut. (11) “Later the other virgins also came, saying, ‘Lord, lord, open up for us.’ (12) “But he answered, ‘Truly I say to you, I do not know you.’ (13) “Be on the alert then, for you do not know the day nor the hour. This represents someone who was positionally saved but later lived in unrepentant sin. Therefore, they were not ready for the Lord’s return. Jesus will destroy them just like any other sinner at His return. Matthew 25:24-30 NASB “And the one also who had received the one talent came up and said, ‘Master, I knew you to be a hard man, reaping where you did not sow and gathering where you scattered no seed. (25) ‘And I was afraid, and went away and hid your talent in the ground. See, you have what is yours.’ (26) “But his master answered and said to him, ‘You wicked, lazy slave, you knew that I reap where I did not sow and gather where I scattered no seed. (27) ‘Then you ought to have put my money in the bank, and on my arrival I would have received my money back with interest. (28) ‘Therefore take away the talent from him, and give it to the one who has the ten talents.’ (29) “For to everyone who has, more shall be given, and he will have an abundance; but from the one who does not have, even what he does have shall be taken away. (30) “Throw out the worthless slave into the outer darkness; in that place there will be weeping and gnashing of teeth. This was a servant of the Lord just like the other slaves. However, he did not do what he was told. He gave the flimsy excuse of being afraid of the Master for not doing what he was told. Matthew 25:40-46 NASB “The King will answer and say to them, ‘Truly I say to you, to the extent that you did it to one of these brothers of Mine, even the least of them, you did it to Me.’ (41) “Then He will also say to those on His left, ‘Depart from Me, accursed ones, into the eternal fire which has been prepared for the devil and his angels; (42) for I was hungry, and you gave Me nothing to eat; I was thirsty, and you gave Me nothing to drink; (43) I was a stranger, and you did not invite Me in; naked, and you did not clothe Me; sick, and in prison, and you did not visit Me.’ (44) “Then they themselves also will answer, ‘Lord, when did we see You hungry, or thirsty, or a stranger, or naked, or sick, or in prison, and did not take care of You?’ (45) “Then He will answer them, ‘Truly I say to you, to the extent that you did not do it to one of the least of these, you did not do it to Me.’ (46) “These will go away into eternal punishment, but the righteous into eternal life. The righteous are not only those that believe but their faith shows up as action. The unrighteous believe in word only but do nothing…they do not obey. This is the principle: God has shown Himself to these men. Verse 19 is just one example of how He showed Himself – through nature. But that does not to mean it is the only way He shows Himself. He has also showed Himself to others through the Gospel of Jesus Christ and the New Testament. The principle includes backsliders and the reprobate as well as those who knew God through nature. Therefore, the last half of Romans 1 is a very clear picture of how someone falls away from God who was once a Christian. If someone can repent from sin and live, then too can someone repent from righteousness and die. To force a man to stay saved when he wants to go live in sin is not the way of the Lord. Psalms 50:16-22 NASB But to the wicked God says, “What right have you to tell of My statutes And to take My covenant in your mouth? (17) “For you hate discipline, And you cast My words behind you. (18) “When you see a thief, you are pleased with him, And you associate with adulterers. (19) “You let your mouth loose in evil And your tongue frames deceit. (20) “You sit and speak against your brother; You slander your own mother’s son. (21) “These things you have done and I kept silence; You thought that I was just like you; I will reprove you and state the case in order before your eyes. (22) “Now consider this, you who forget God, Or I will tear you in pieces, and there will be none to deliver. These were what we would call preachers today! God calls them wicked but they are obviously preachers in the sight of man because they take the Covenant in their mouths. Matthew 24:10-13 NASB “At that time many will fall away and will betray one another and hate one another. (11) “Many false prophets will arise and will mislead many. (12) “Because lawlessness is increased, most people’s love will grow cold. (13) “But the one who endures to the end, he will be saved. There is coming a great falling away of many in the Church. The Scripture is very clear on this point. This guest represents someone who was invited and accepted the invitation to come to Christ. However, this guest never obeyed and did what the Lord said. And so his garments of the world remained, representing his sins. So when it came time to be ready for the wedding, representing the Lord’s coming, he was not dressed in the Lord’s righteousness. He was then rejected just like the other sinners. His fate is ultimately the Lake of Fire. Luke 12:45-48 NASB “But if that slave says in his heart, ‘My master will be a long time in coming,’ and begins to beat the slaves, both men and women, and to eat and drink and get drunk; (46) the master of that slave will come on a day when he does not expect him and at an hour he does not know, and will cut him in pieces, and assign him a place with the unbelievers. (47) “And that slave who knew his master’s will and did not get ready or act in accord with his will, will receive many lashes, (48) but the one who did not know it, and committed deeds worthy of a flogging, will receive but few. From everyone who has been given much, much will be required; and to whom they entrusted much, of him they will ask all the more. The slave was a servant of God but fell because of his actions; in word he would still have called himself a servant but his actions proved otherwise. Jude 1:12-13 NASB These are the men who are hidden reefs in your love feasts when they feast with you without fear, caring for themselves; clouds without water, carried along by winds; autumn trees without fruit, doubly dead, uprooted; (13) wild waves of the sea, casting up their own shame like foam; wandering stars, for whom the black darkness has been reserved forever. Really, the whole book of Jude is talking about Christians who have fallen away, or those claiming to be Christians, and the punishment they are awaiting. It is very clear that these people were once Christians, but now in practice they are no longer Christian. It is also clear that they are lost, for it says it would have been better for them to have never known than to have known and turned away. Therefore, their fate will be much worse than that of a regular sinner’s fate. Proverbs 21:16 NASB A man who wanders from the way of understanding Will rest in the assembly of the dead. This is someone who knew the Truth but wandered away. The result is spiritual death, where the rest of the dead reside. Ephesians 5:27 NASB that He might present to Himself the church in all her glory, having no spot or wrinkle or any such thing; but that she would be holy and blameless. Jesus is coming back for a glorious Church with no spot or wrinkle, holy and blameless. A backslider living in intentional sin does not qualify. They would be lost should the Lord return when they are not ready, i.e. having not repented. James 1:27 NASB Pure and undefiled religion in the sight of our God and Father is this: to visit orphans and widows in their distress, and to keep oneself unstained by the world. Being stained by the world would disqualify the backslider from being included in the Glorious Church. The one who purposely lives in sin is not abiding in God but rather in the devil and his kingdom. This is speaking of our inner man – our spirit. It is impossible for our born-again spirit to live in sin for it goes against the spirit man’s very nature. But we also have a mind and flesh which can live in sin. The backslider no longer abides in God because they have given themselves over to the flesh, the devil and the carnal mind. Therefore they do practice sin. “He cannot sin” does not mean sin is non-existent for that person; otherwise, the New Testament would not have warned the Christian so often about sinning. This phrase simply is a statement of the Christian’s intent in their spirit if they are right with God. They would not practice sin as a lifestyle if they are right with God, i.e. they would not sin because of their new nature which wants to please God. Rev 21:27 and nothing unclean, and no one who practices abomination and lying, shall ever come into it, but only those whose names are written in the Lamb’s book of life. If the Jews are thrown into outer darkness, how much more those who knew Jesus then lived their own lives of selfishness and sin. If God gives someone over to a reprobate mind (Romans 1:28 – 32), they are lost forever. They cannot be redeemed nor would they want to because their mind is bent toward hating God. Sin and the backslidden state can lead to this! 1 Corinthians 9:27 NASB but I discipline my body and make it my slave, so that, after I have preached to others, I myself will not be disqualified (reprobate). 2 Timothy 3:8 NASB Just as Jannes and Jambres opposed Moses, so these men also oppose the truth, men of depraved mind, rejected in regard to the faith. Titus 1:16 NASB They profess to know God, but by their deeds they deny Him, being detestable and disobedient and worthless for any good deed. Hebrews 4:11 NASB Therefore let us be diligent to enter that rest, so that no one will fall, through following the same example of disobedience. Hebrews 4:14 NASB Therefore, since we have a great high priest who has passed through the heavens, Jesus the Son of God, let us hold fast our confession. Lordship salvation is the only kind of complete salvation! James 5:19-20 NASB My brethren, if any among you strays from the truth and one turns him back, (20) let him know that he who turns a sinner from the error of his way will save his soul from death and will cover a multitude of sins. Notice a brother “among you.” This person IS a Christian positionally. This straying results in DEATH,but he can repent! This is talking about the backslider, not a reprobate. 1 John 5:16-17 NASB If anyone sees his brother committing a sin not leading to death, he shall ask and God will for him give life to those who commit sin not leading to death. There is a sin leading to death; I do not say that he should make request for this. (17) All unrighteousness is sin, and there is a sin not leading to death. The sin unto death is knowingly rejecting God. This person would become apathetic toward God or would hate God. This person cannot repent; they are forever lost. Hebrews 10:26-29 NASB For if we go on sinning willfully after receiving the knowledge of the truth, there no longer remains a sacrifice for sins, (27) but a terrifying expectation of judgment and THE FURY OF A FIRE WHICH WILL CONSUME THE ADVERSARIES. (28) Anyone who has set aside the Law of Moses dies without mercy on the testimony of two or three witnesses. (29) How much severer punishment do you think he will deserve who has trampled under foot the Son of God, and has regarded as unclean the blood of the covenant by which he was sanctified, and has insulted the Spirit of grace? I believe falling away from the Faith is much more common than most realize. We are living in the days of apostasy. I believe the Great Apostasy comes/has come as a result of Christians abusing the doctrine of Grace. Grace is right but some teach it wrong, such as “a Christian cannot sin” and “you don’t need to ask for forgiveness because you are pre-forgiven.” But whether taught right or wrong, Satan is using the doctrine to make Christians dismissive of sin – even a lifestyle of sin. I believe most in the Great Apostasy will be the backsliders, not reprobates. But if they do not repent, the end result will be the same as that of a reprobate – forever lost. 2 Corinthians 13:5 NASB Test yourselves to see if you are in the faith; examine yourselves! Or do you not recognize this about yourselves, that Jesus Christ is in you—unless indeed you fail the test? Romans 8:9 NASB However, you are not in the flesh but in the Spirit, if indeed the Spirit of God dwells in you. But if anyone does not have the Spirit of Christ, he does not belong to Him. James 2:14-20 NASB What use is it, my brethren, if someone says he has faith but he has no works? Can that faith save him? (15) If a brother or sister is without clothing and in need of daily food, (16) and one of you says to them, “Go in peace, be warmed and be filled,” and yet you do not give them what is necessary for their body, what use is that? (17) Even so faith, if it has no works, is dead, being by itself. (18) But someone may well say, “You have faith and I have works; show me your faith without the works, and I will show you my faith by my works.” (19) You believe that God is one. You do well; the demons also believe, and shudder. (20) But are you willing to recognize, you foolish fellow, that faith without works is useless?